The global chip scale package (CSP) LED market was valued at US$ 844.2 Mn in 2016 and is projected to register compound annual growth rate (CAGR) of over 13.90% from 2018 to 2026, according to a new report published by Transparency Market Research (TMR) titled “Chip Scale Package (CSP) LED Market – Global Industry Analysis, Size, Share, Growth, Trends, and Forecast, 2018–2026.” The report suggests that rising use of chip scale package (CSP) LED across automotive, consumer electronics, and media & entertainment industries worldwide along with the rising trend of using technology such as augmented reality or virtual reality around the globe is likely to spur the demand for chip scale package (CSP) LED in the coming years. As key players introduced chip scale package (CSP) LED in developed markets such as North America, Europe, and Asia Pacific, these regions are likely to account for dominant share of the global chip scale package (CSP) LED market. 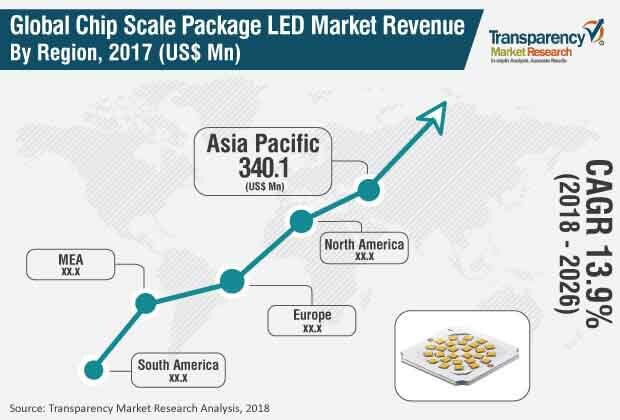 Growing demand for chip scale package (CSP) LED for large number of lighting applications such as backlight LED and flash LED, growing trend toward use of CSP LED across automotive lighting, and presence of large number of well-established players across China, Republic of Korea, and Taiwan is likely to boost growth of the Asia Pacific chip scale package (CSP) LED market at a growth rate of around 13% from 2018 to 2026. Chip scale package (CSP) LEDs are used for many applications such as backlighting, spotlighting, high bay, and low bay lighting. The bigger advantage of CSP LED is its smaller form factor that makes it easily applicable to any compact device such as smartphones. Furthermore, to get the smaller form factor of the CSP LED, many manufacturers remove many of the elements from the system. Additionally, LED die gets directly soldered onto a PCB with the help of P and N contacts, which results in thermal resistance reduction between the PCB and LED die. However, heating can be a serious issue, as there is no ceramic submount that spreads the heat between the PCB and die. Rising heating related problems result in reduced reliability and LED lifetime, poor light quality, and ultimately catastrophic failure. However, with continuously evolving technology pertaining to CSP LEDs, many manufacturers are coming up with novel methods to deal with the thermal issues. Issues related to thermal factors for chip scale package LED is expected to have a medium impact on the global chip scale package LED market. Many applications including backlight LED, flash LED, automotive lighting, and general lighting are using chip scale package (CSP) LED for higher efficacy and efficiency. CSP LEDs have smaller form factor that enhances the design flexibility in luminaires and also help in increasing the brightness. CSP LED is extensively used across multiple applications especially backlight and flash LEDs. CSP LED helps in making the displays slimmer, as they have a smaller size than the traditional LEDs. Furthermore, CSP LEDs are also used prominently across flash applications used in smartphone cameras. Many smartphone manufacturers including Samsung have adopted CSP LEDs in their camera. Large number of players are innovating and launching novel CSP LEDs for flash light applications to be used in smartphones. For instance, in September 2017, Osram Opto Semiconductors GmbH announced the Ceramos C chip-scale package (CSP) LEDs made for applications related to flash lights. The novel CSP LEDs are compact in size and can be integrated easily into smartphones. In terms of value, Asia Pacific was the leading contributor to the global chip scale package (CSP) LED market in 2017. The contribution is primarily due to the booming chip scale package (CSP) LED marketplace along with the presence of well-established players across the region, especially driven by countries such as China, Taiwan, Republic of Korea, and Japan. These countries are home to many well-established players from the chip scale package (CSP) LED domain including Samsung Electronics Co., Ltd., Seoul Semiconductor Co., Ltd., LG Innotek, and Nichia Corporation among others. Many players from this region are focusing on launching novel CSP LEDs worldwide. For instance, in March 2018, Samsung Electronics Co., Ltd., launched the novel fillet-enhanced chip-scale package LEDs named as “LM101B,” “LH181B,” and “LH231B.” The company had introduced CSP LED solutions in the year 2014 but with relatively lower efficacy as compared to LED packages that are conventional. The novel product has higher efficacy levels and can be applied to mainstream LED lighting environments. OSRAM Opto Semiconductors GmbH, LG Innotek, Lumileds Holding B.V., and Samsung Electronics Co., Ltd. among others are some of the major players operating in the chip scale package (CSP) LED market profiled in this study. These players are producing CSP LEDs on a mass scale due to the increasing demand around the globe. For instance, Seoul Semiconductor Co., Ltd., a semiconductor technology company announced that its WICOP (wafer-level integrated chip on PCB) a product from the CSP LED portfolio that is made for applications related to general lighting is in mass production. The company has opted for mass production of this product for automotive lighting and display backlighting applications.